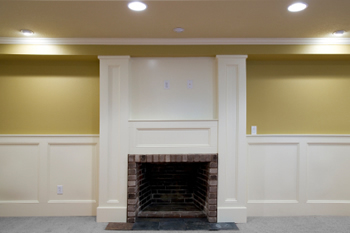 For a unique and elegant approach to wall decoration wainscoting has become a popular improvement to the most basic of wall décor. 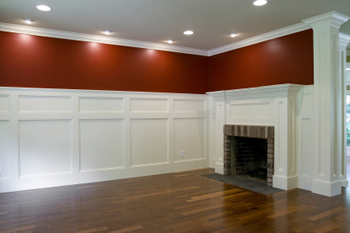 With an adept installer of wainscoting you can achieve additional architectural beauty and interest within your home. With the choice of several styles and materials we can offer you a cost-effective solution to wall adornment and decoration. 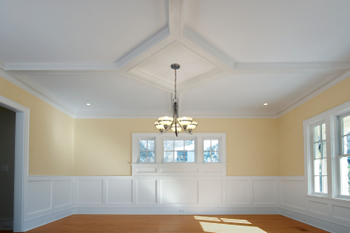 Our company offers traditional Canadian wainscoting which can be viewed in our Toronto showroom. Installing at the lower portion of the wall raised panel wainscoting offers you panel style adornment and coverage of walls and stairwells. This style of panel work can provide a wall with a significant achievement of style on an otherwise basic structure. Originally used as a hardier and easily maintained alternative to a painted wall wainscoting was an expensive and laborious process. Set to a flat base of wood each raised panel exhibits a design or decoration such as large strips placed vertically. Square panels and carved trim patterns are also highly popular. Flat panel wainscoting is a design alternative to raised counterparts, it is traditionally highly prevalent in large family areas such as living, dining rooms or kitchens. Often regarded as a less formal type of paneling, it’s simple look and straight edges grant defined and unobtrusive quality to a room. Another form of wainscoting using beadboard provides an installation similar to other wainscoting styles but with an emphasis on the presence of vertical lines. With this in mind it is important that the beadboard is installed perfectly given that if unbalanced the lines and visual effect may be disrupted. 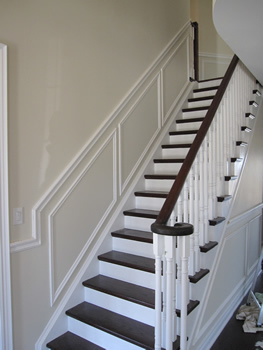 We offer our customers expert installation of a variety of wainscoting; we provide stained, patterned and stock designs. The availability and quick installation can provide considerable improvement to an otherwise dull and basic wall trim.